Nutritional factors are often the difference between a great breeding season and a disaster. At The Birdcare Company we believe that we have produced the most effective supplement system for breeding birds in the world but the system contains five key products used at different rates at different times of the year. For newcomers to supplements or people with big collections and little time we recognise that something simpler is very attractive. This is why we have developed EasyBird. During the breeding season EasyBird Super Breeder supplies all the key nutrients from Daily Essentials3, Calcivet, Flourish, ProBoost SuperMax and BioPlus. It is simply added to soft food or finely chopped fresh fruit and veggies, sprouted seeds or soaked/cooked pulses. The only concession is that, because the calcium is best not given everyday, we strongly recommend that one or two days each week are supplement free. Key Features:Comprehensive all in one supplementation for breeding birds. This product contains calcium, vitamins and minerals, amino acids, protein and a powdered probiotic. Suitable for parent and chick birds. Application: Feed EasyBird Super Breeder 5 or 6 days a week. 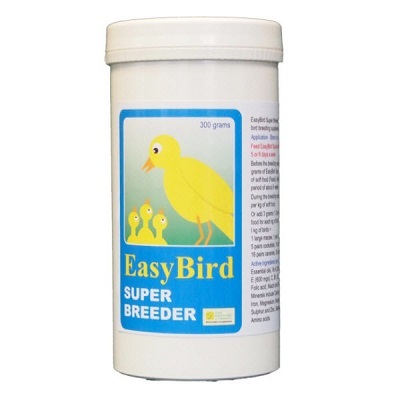 Before the breeding season add between 50 and 75 grams of EasyBird Super Breeder to each kilogram of soft food (Feast). Ideally increase the level over a period of about 6 weeks. During the breeding season add 100 grams per kg of soft food. Or add 3 grams (1.2 level teaspoons) to a day's food for each kg of bird weight. 1 kg of birds =1 large macaw, 1 pair of greys/Amazons, 5 pairs cockatiels, 10 pairs budgies, 16 pairs canaries, 30 pairs small finches.